I’ve noticed the birds are eating the seeds from our sunflowers growing in our child care center. Can the children eat them too? The birds are attracted to sunflowers in your garden because they benefit from the high nutritional value sunflower seeds provide. They are also preparing for the winter months when there will be less food for them to eat. Sunflower seeds are an excellent source of minerals like potassium, calcium, magnesium, and iron as well as vitamin B complex, and a valuable source for protein, fiber and polyunsaturated fat. Sunflower seeds are a healthy snack for children as well. Harvesting and eating the seeds is a great way to celebrate the season and bring the harvest to the table as a snack or as part of an ingredient in a meal for the children. Research shows that harvesting and cooking from the garden is a successful strategy for enhancing children’s healthy eating habits. Preparing sunflowers seeds for eating is simple. 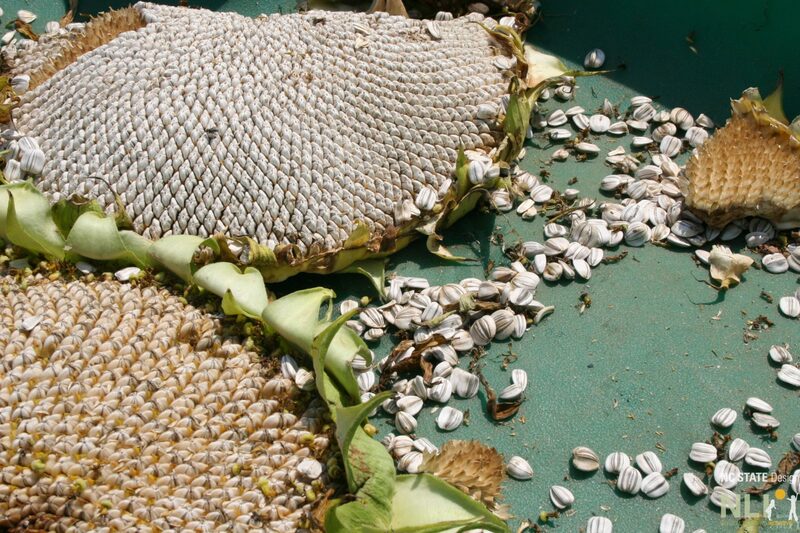 According to Kids Gardening of the National Gardening Association, (https://kidsgardening.org/garden-activities-plant-a-sunflower-house/) sunflowers that are ready for harvest will look like they are dying: the flower head will start to turn from green to yellow and flop over from the weight of the seeds. To prevent birds and squirrels from harvesting the maturing seeds, cover the heads of your sunflowers with cheesecloth, or with a brown paper bag. You can also cut the seed head with at least 12 inches of the stock and bring it indoors to dry. When completely dried, which will take from one to four days, the seeds will easily fall from the seed head. 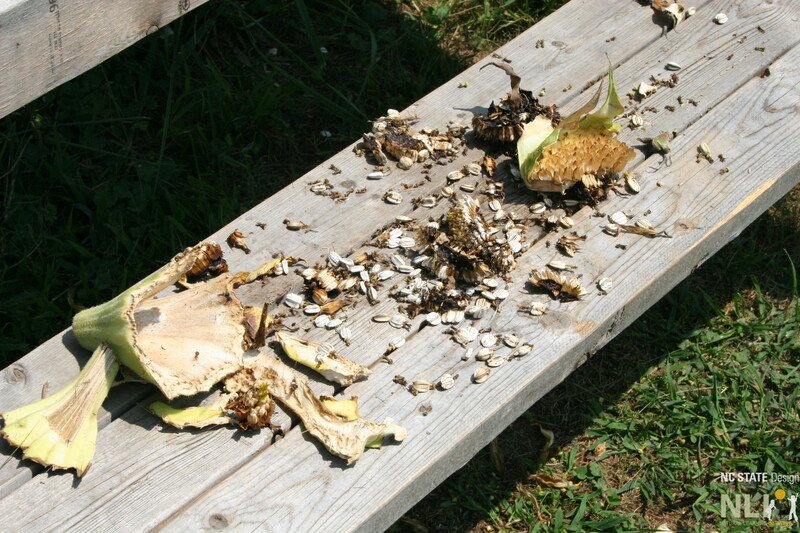 The sunflower seeds can then be washed and eaten as is, or lightly toasted in the oven. Sunflower seeds from a child care center in Western North Carolina. The children enjoyed investigating these sunflower seed heads. Sunflower Houses: Inspiration from the Garden-A Book for Children and Their Grown-Ups, Sharon Lovejoy.